There is an undoubted Impact of mobile industry on the development of various industries. This statement is evident from the statistics that around 6 billion gadgets are in use by 2020. Mobile industry is just wrapping the whole business world. Just with the help of mobile device in your use, you can be connected with any of the information globally, as it is one of the best means of communication. So much is the importance of mobile app development, so as the importance for the technology stacks for mobile development. Development Platform: Here the libraries and interfaces are designed and developed for a mobile app. Frontend Development: With respect to the mobile app, user’s interaction with the interface is designed. Backend Development: Here, the user’s input is received and processed for delivering the respective outputs. Additional Requirements: Various other technology elements effecting the mobile app like performance, security and its robustness are included. 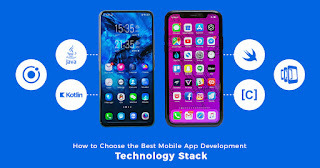 The above explains the Technology Stack for Mobile development, following are the types of Technology Stacks for various mobile app development. The objective of the mobile app development decides the choice of the technology stack used. The mobile app that relies on load processing need a strong technology stack than that of operate around optimized interactions. So as the difference in the choice of mobile app technology stacks, if it has to develop a high latency app versus a low latency app with fast response. It can create a lot of difference in the choice of the best technology stack for the mobile development. Various brands are offering the best community support and documentation. Adobe, Microsoft, Google are some of the examples of big brands which offer the advanced development options and best community support, than Facebook. Relying on the developer’s skill set for deciding between two stacks which belong to similar technology. There are so many languages that give the same results, yet they have their uniqueness in some differentiating factors. When technology which is not known by the operating developers is used, it required more time, effort and cost for developing the mobile app. On the other hand, stack of mobile app technology makes it possible to streamline the process, saving the time and efforts of the team. The above mentioned elements helps to decide the language, libraries, set of framework and the software which need to be combined for the development of desired mobile application. The various mobile app developments mainly focus on resisting against the various security threats. The various technology stacks are not just sufficient for documentation or for writing a lengthy codes, but it will also make the development process risk prone. After this comes the skills of the developers. It is fact that what so ever the technology stacks used, hackers will find some or the other way to harm it. So, apart from the technology, developers should also need to have strong skills in their respective domain. For the perfect project development, technology stack for mobile application that is lined up with the technology serves good. This is important to check once the development process has started. Also, the current project should be checked for the compatibility with the technology stack, even the compatibility with the various tools involved need to be checked. The technology stacks which are required to run on a single platform would be different from that which can run on multiple platforms like Android, Web and iOS. The level of scalability that decides the portability of the mobile application on various platforms. In case of cross-platform app development, or hybrid applications, different set of tools are required for developing native apps. As mentioned above, there are so many ways by which one can choose best and most suitable technology stacks for the mobile app development. Before the starting any project, it is important to decide the technology stack, as the software product has the capacity to boost your business. The technology stack which you choose should fit perfect for the app structure which you wanted to have and can be scalable and innovative.